Don’t you just hate it when you reach into your bag and it takes you forever to find your phone until you eventually mess up the contents of your bag? Cables get all tangled up and things start unraveling. I, for one, definitely know this story all too well. And I’m sure I’m not the only one. To help us solve this dilemma, Copenhagen-based technology blogger, radio broadcaster and TV host Christiane Vejlø collaborated with London-based brand Knomo to create a digital clutch bag that meets the needs of modern women. The bag, called Elektronista, has been created with a focus on a woman’s digital life – the juggle between work, leisure and travel. (Cue hallelujah song! This bag was clearly made for me!) Designed to take you from day to night, the Elektronista is made from a soft full-grain leather with a detachable chain/leather shoulder strap. 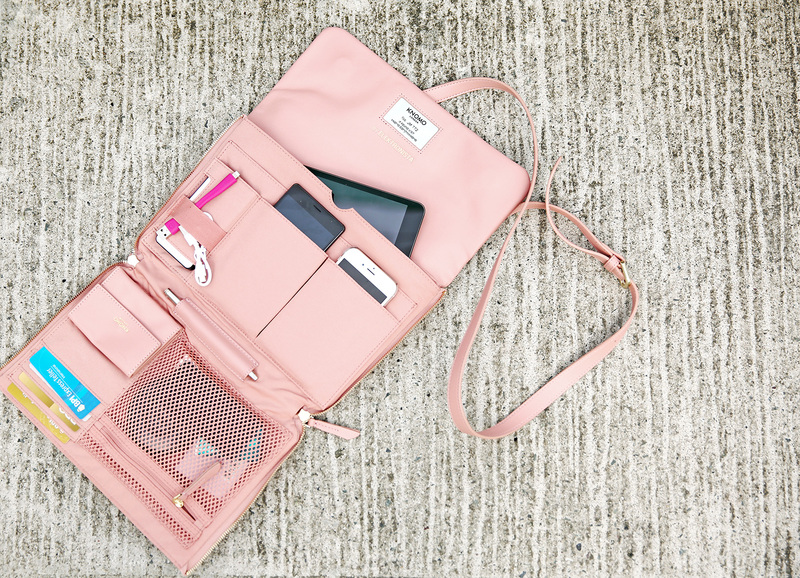 On the inside, it unzips at either side to transform into a flat, practical layout of pockets and compartments for all your essentials–tablets, phones, passports, credit cards, charging cables and just about anything else an on-the-go woman needs. There’s even a 3000Mah battery with charging cable included in the bag! How thoughtful! 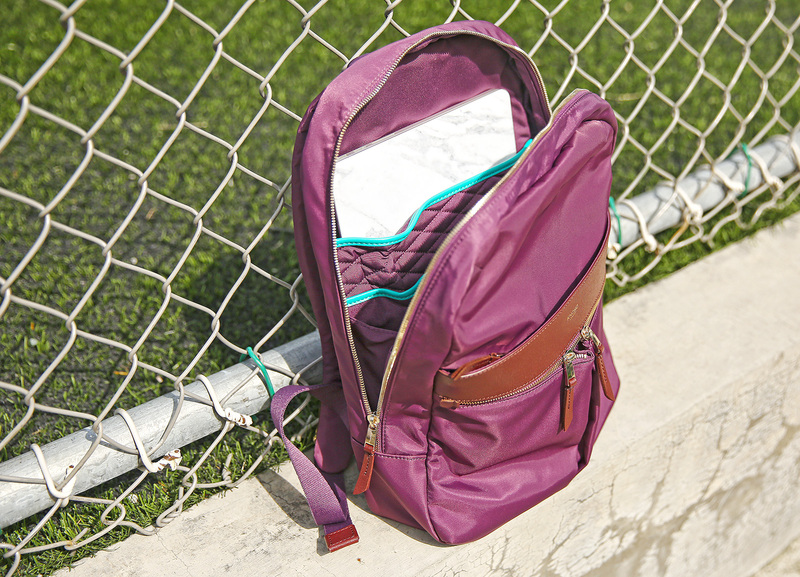 If you’re not into feminine designs and prefer a sporty looking bag however, Knomo also has the Beauchamp backpack, among its many other designs. You see, Knomo strives to create unique accessories to protect technology and organise belongings for both men and women so there’s definitely a design for everyone. The Beauchamp backpack is my ideal “airplane bag”. It fits all my laptop and other gadgets, and has plenty of room for extra clothes and other essentials. Plus, I don’t have to worry about my laptop, camera and other gadgets getting damaged while inside my bag because aside from having fully padded compartments, Knomo drop tests its bags 2500 times with 15 kg inside. Now that’s quality! The Elektronista is available in black, gray and blush (as seen below) while the Beauchamp is available in black and aubergine (as seen below). Knomo is distributed locally by Think About Tommorrow and is available at Powermac and Rustans. Like Knomo Philippines on Facebook to get more updates. Well that one was really awesome! Clearly nowadays with all those of stuff that we had, it’s very frustrating at times that your bag is a little bit messy and every time you cleaned it up, there it go again, heading back to the jungle. And what’s frustrating most is when you’re in such a rush and you just can’t find that thing that you’ve been looking for! It’s good to know that they make such as compartments because I usually use pouches and believe me, I sometimes forgot where-is-where-that-thing and it’s all messed up again. :) I also even love their style! I can totally understand your frustration. And to make matters worse, your things get messed up even more whenever you need them more or you’re in a hurry! Pretty as ever! That clutch bag is pretty but I’m gonna go with the backpack! Haha! Loved it! Super smart bag! LOL! Thanks Anne! :) Hindi pa Christmas! Haha! I love that blush bag and I need to look into one as I’m always taking my gadgets everywhere and I always losing my things inside a massive bag. That bag sounds amazing. It’s quite a handy idea. I always love it when a bag has an inner zipper compartment but that’s even better. Probably one of the smartest bags I’ve seen!